I want to throw my arms up and cheer! Finally, the days of searching for Facebook and finding dozens of fake Facebook apps are hopefully behind us. Microsoft is finally making it against the Windows Store policy to make apps that are titled and have tiles to mislead customers into thinking it is an official popular app or game. For the past two years, the Windows Store has been plagued with fake and misleading apps. For instance, you might find a fake version of the popular game, Temple Run. Such apps disguises itself as Temple Run and tricks users into downloading, or worse purchasing, the app. Once installed, the user finds that the app is nothing more than screenshots of the game Temple Run or a tutorial of Temple Run, written or otherwise. I have seen many such apps on the Windows Store, along with negative reviews by angry customers who were tricked into paying real money for the fake app. Another experience you might relate to is the fact that there are so many fake apps, searching for the real app becomes difficult and confusing. For instance, if you searched for Twitter on the Windows Store, you got several fake twitter apps filling up the search results. The real Twitter app might be among them, but you have to look extra hard to spot it. These kind of things really degraded the Windows Store user experience. Here at McAkins Online, we have been complaining for the past couple of years. And finally, Microsoft is taking steps to bring a stop to this. Microsoft posted a new block post, stating that the company has released revision 6.0 of App Certification Requirements for the Windows Store. The new policy adds the following conditions in order for an app to be listed in the Store. Apps must be titled clearly and must not mislead users into thinking it is another app. If the app is a guide for a popular game, for example, it must be clearly labeled as such, with the word “Guide” being before the name of the game. These names are acceptable: “Guide for Subway Surfer”, “Images from Instagram”. These names are NOT acceptable: “Angry Birds — Guide”, “Instagram Images”. The icon for the app or game must not look so much like that of another app or game as to make users think it is the other app. Here’s an image Microsoft used to demonstrate this. The category that the app is placed in must not be misleading either. A tutorial for the game must be placed under something like “Books” or “References” and NOT under “Games”. This policy applies to both new and existing apps. Until existing apps get their act together, they will NOT be displaced in the new version of the Windows Store. 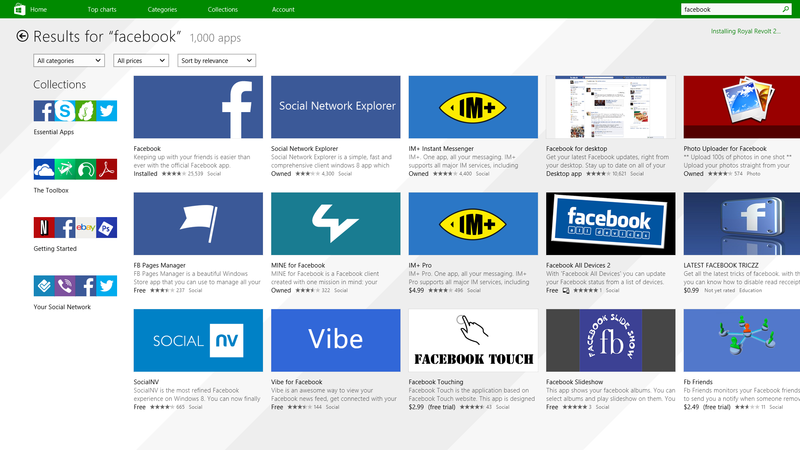 Here’s a demo of what I see when I search for Facebook on the Windows Store now. I only see one Facebook app. There are a couple of similar apps, but they clearly have different icons and title. Finally, there is hope for the Windows Store!